For years, my friend would bring these delicious butterscotch bars topped with chocolate to parties, and she finally relinquished the recipe to me. This dessert is super easy to make and tastes great with organic ingredients. Although the recipe is quick to assemble, the bars do require refrigeration before serving. It is best to plan ahead, although I have sped things up in the freezer before. Spread the chocolate chips with a butter knife or spatula over the hot bars. The heat from the bars will melt the chocolate. Cut the bars with a knife, then refrigerate for at least an hour. It is very important to cut the bars when they are still hot, as they are impossible to cut once they have hardened. My children really love this sweet treat, and I like that they are simple to make. 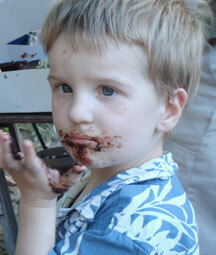 My kids also think it is cool that the heat of the bars melts the chocolate, and the spatula is fun to lick too! Looks fantastic…thanks for sharing, I will be sure to try this recipe for my sons!